Training Update: 20 November – TMI? I’ve had a sciatic nerve inflammation wreaking havoc with me for a long time. Since oct 2005, in fact. I’ve mostly just coped with it. I take conference calls standing up, I avoid chairs where my knees are higher than my hips, I gave up big heels, and I sleep with my leg turned a certain way. Two orthopedic surgeons, two physiotherapists, and a massqage therapist in the States were convinced it was a hamstring problem and best they did for me was a lot of flexeril. I really thought this was just going to be permanent. I got to the UK, and was advised that the culprit was likely the nerve, and the assigned tracking exercises made an incredible difference. I was amazed how something so basic radically improved the situation. I still was in agony when required to sit for long durations, but I could manage long haul flights with anti- inflammatory meds. Even better, the stability work I’ve been doing all year was expected to help set me straight long term. Then, it seemingly flared up out of nowhere. Seemingly because the pain didn’t specifically correlate with anything I did or didn’t do. Such was true until I woke up very sore along the nerve in my back after a more challenging run at the end of October. An MRI was suggested, so I once again benched myself, and I waited. The radiologist’s report claimed a normal result, which my sports med doc agreed with and suggested a few weeks of accupuncture. More than half of MRIs administered to people my age show disc issues that have no injury symptoms according to the doc, so it seems that a normal scan may just mean nothing extreme. A few weeks in, I’m no better, and my physio, who is a spine specialist, is encouraging a second opinion because he and several of his colleagues think that the bump highlighted in the picture is the cause of my woes. 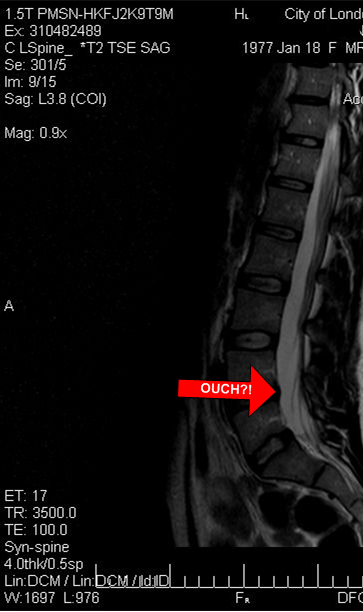 That’s where a disc appears to be pressing on my nerve. So, my goals of racing the train will not be met this year, but I’m still not giving up. This entry was posted in Franc v. Tube, Weekend Warriorism. Bookmark the permalink.